My world is focused on diet, exercise and helping people lose weight and then maintain the weight loss they achieve. I speak with patients daily about making lifestyle changes and making those changes habitual. I started thinking about habits and how bad habits are hard to break and good habits are hard to start. Why is that? I decided to look up the definition of habit according to Merriam-Webster. The definition of habit: manner of conducting oneself; the prevailing disposition or character of a person’s thoughts and feelings : mental makeup; a settled tendency or usual manner of behavior; a behavior pattern acquired by frequent repetition or physiologic exposure that shows itself in regularity or increased facility of performance; addiction. Do any of these things describe you or your behaviors? I can think of several things I do that are defined as habitual and not all of them are good! Breaking a habit is all about making changes. Change is defined by Merriam Webster as: to make different in some particular : alter; to make radically different : transform; to give a different position, course, or direction to; to make a shift from one to another : switch; to undergo a modification of; to become different. Change is definitely not an easy thing. Logic tells us facts, and fear should inspire and motivate us to change. Sometimes this is true, however, motivation is often lost due to the belief that it “won’t really work this time because it never has in the past”. For instance, did you know it takes the average smoker 6-11 serious attempts to quit smoking? That is a lot of attempts to break a habit! Changing your lifestyle behaviors and habits can require the same amount of attempts. We give patients a lot of information about what and how to make changes and hope and expect them to make a bunch of lifestyle changes. Information is of benefit and a good thing to pass along, but information alone is not enough to change a behavior. Relying on information alone to spark change is insufficient for many people. Fear of consequences is not a perfect motivator either. 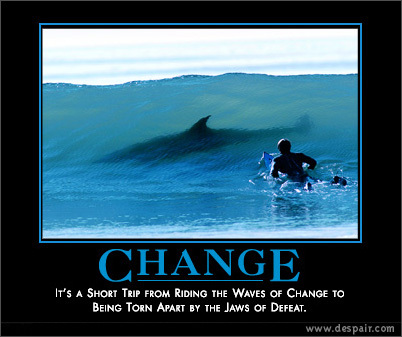 There is a true saying that “nothing happens until the pain of staying the same outweighs the pain of change”. The consequences of not changing gets some people to change, but not all. Some people remain unchanging in painful situations. They are frozen in fear. They deflect the anxiety of the problem by ignoring, minimizing or making fun of it. “I’ll go out in a massive heart attack rather than spend years doing crunches and eating cardboard food!” People are well aware that the ultimate risk of smoking or not losing weight is death. Yet, the fear of death is too overwhelming to act upon. Some people internally panic and go into flight-or-freeze mode. They must make death a remote possibility. And some people do not change due to the fact they are resigned to the belief they are doomed to remain the same. No matter what efforts they make, they believe they will not be able to change. They suffer from learned helplessness, a condition where they believe they have tried everything and that nothing will work, even if they do try. Change is a process, not a moment of transfiguration. Keep in mind that change takes focused attention to become a habit. You need to be purposeful (set a schedule to work-out, track your calories, eat multiple small meals each day), get relational support (our medical staff at FWL, family and friends), identify methods that work and continually apply the strategies. Once a habit is formed, it will give the budding change the momentum to make it easier and easier to maintain the change. Within a period of time, the change will take root, transforming into a healthier, new you. I found this quote by David Jakes: “Endless conversation about CHANGE is the barrier. Actually committing to doing something and then ACTING is what IS REQUIRED”. 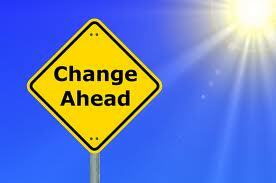 Hopefully the change(s) you make will instill a new, healthier habit in your lifestyle! Get busy, get moving and start the new habit of a healthier life today!